I found this interesting article by KarmaQU_EU on the EU Forums sub-domain "Gameplay"
Although he/she tries his/her hardest to state his/her views, he/she tends to contradict the fact the Asashio really needs to be balanced to join the game and on par with other DD's of that tier. No premium ship should be OP, they obviously will get some enhancements, for instance, an extra module slot, slightly better AA, perm camo's, etc. 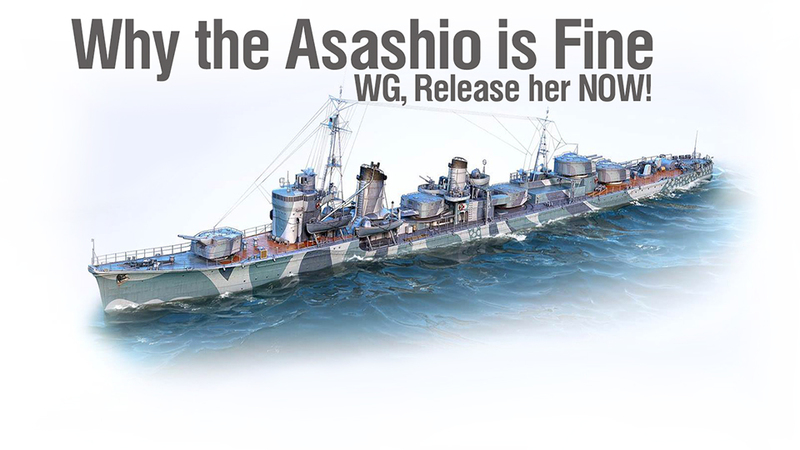 The Asashio is perfectly balanced and ready to release as is or with minimal adjustments, this I have concluded as a counterargument to the naysayers. If it is OP all WG need to say is “we made a mistake” and pull it from sales. But not before players rush to grab themselves an OP toy. And a none-OP ship will never sell, no? And if it is not OP it is lauded as an “everyman’s ship”. WG is praised, it becomes a staple seller, and WG gains profits anyways. And no ship WG releases will ever be too OP that a pull-from-sale is insufficient to address. Think the old breed premiums and a few singular new premiums which were ... a bit too purposefully designed to be “considerate” to the player/buyer. 1. A slight but obvious flaw or downside is designed right within their primary armament. A “tradeoff”. But otherwise performs “marvellously” against the “intended targets”. And no idiot will be trying to use it against “unintended targets” right. 2. Their primary armament will only cause significant stress for a minority portion of players at a time. And at least one portion of the population will be a direct counter to this ship. (OP CVs will only cause stress to other CVs. OP DDs will be hunted by other specific ships or the meta in general and OP CAs will always eat a citadel or two.) This means that at any given time the number of players crying to WG will only be a minority, and thus unable to generate great disorder on forums or anywhere else. And their situations will also be a minority experience thus unlikely to garner much support. Especially CVs. 4. A possibility of a common “critical failure” situation must exist for that ship, either via hard design or in “noob trap” scenarios where inexperienced players will choose an option or build for that ship which is inefficient and astoundingly failure. In this way, WG can claim that the ship “is balanced and not OP”. Experienced players, however, will have no trouble using the ship to seal-club efficiently. In short, the stats and examples of the inexperienced players become a publicity smokescreen for the real purposes of that ship. 5. Another premium ship in a completely new direction and different type will be envisioned and released to high publicity after the previous premium direction is “saturated” or at “high-publicity risk”. Via rotating between methods and redirecting players’ attention, based on careful analysis of prior situational feedback, WG is able to sustain a cycle of success. A purposefully “weak” or “show” premium is released every now and then to add variety and break the pattern of these cycles, and high-profile, historically esteemed ships are usually dealt with more cautiously and deliberately. 6. The premium ships are “MM” safe meaning they will be viable both low to mid-tier and as top tier. This is a highly attractive trait because it takes out a major stressor in the game. It is also part of the tactic of “far apart” OPness. Combined with the economy and Captain training, this ensures players are psychologically soothed when using the ship to the game. This trait is viable because of WGs philosophy of introducing purposeful stressors into their games, even to the point of purposefully “crippling” silver ships (with exception of T10s which will never have to face a direct premium competitor as WG does not release T10 premiums). In short, premiums are the ideal and obvious solution (too obvious) to the chaotic and toxic problem which is the game itself. 7. Good players cannot recognize or be sensitive to quite a lot of these traits since they are good and will perform and enjoy the game even though a lot of the negatives. They provide a kind of false advertisement and debased goodwill/positiveness on the purpose of premiums. To the point that we think “premiums are gimmicky, quirky situational ships that require skill to play well.” Amongst other understanding things. In short, it is unwitting propaganda. But as I have made points of already, the purpose of premiums is not some scholarly venture at new possibilities and creativity in this game, but rather a highly controlled and engineered conundrum leveraged on players to elicit specific conformity and reaction. Premiums will always be OP and preferable, but not obviously. Just like the game will always be F2P but many other things as well. Now I must prepare for my trip to the Gulag. (But not before I give penance to all the seals I have clubbed with premiums.) Been nice knowing you all.